We’re working on a specialized search page, with tailored searches, to launch our next #MSWL day, July 28. 1) Go to Twitter Advanced Search. 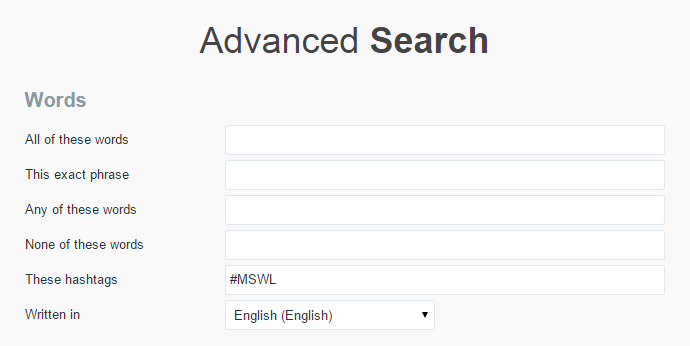 2) Add “#MSWL” to the hashtags and, if you prefer, select English. 3) Type words–such as your genre, or identifying characteristic–into one of the top three boxes. 5) Keep trying. Remember that many people may use abbreviations. So, for example, if you’re looking for someone who wants Young Adult, also search YA.